This Sunday Eucharistic Celebration online at EDSA Shrine is aimed at helping Filipinos living and working abroad be closer to Jesus. However, it shall not take the place of the actual participation in the Sacrament especially for those who can come to church on Sunday. My Jesus, I believe that You are present in the Blessed Sacrament. I love You above all things and I desire You in my soul. Since I cannot now receive You sacramentally, come at least spiritually into my heart. As though You were already there, I embrace You and unite myself wholly to You; permit not that I should ever be separated from You. Amen. The bishops of the Philippines have declared 2018-2019 as the Year of the Youth. It is good to reflect on the relationship between the youth and Christmas since we often say that Christmas is for everyone but especially for the young. To fulfill His plan to save us, God sent His Son as a child. Jesus is his name, meaning "God saves His people". Isaiah prophesied a time of JOY and PEACE "for a child is born to us, a son is given to us, upon his shoulder dominion rests" (Isaiah 9:5). The rule of the Child King ushers in joy and peace from God. Only the child-like can bring joy and peace to world. The Filipino youth deserve genuine joy and peace offered by the Savior Jesus, "the infant wrapped in swaddling clothes and lying in a manger" (Luke 2:12). This year we also mark the 200th anniversary of the famous Christmas carol SILENT NIGHT, first sung in a village church in Austria on Christmas Eve 1818. Since then the song has provided a message of true Christmas joy and peace to generations of Christians all over the world. Silent night. During the time of Jesus up to our contemporary time, some nights have become moments of ominous silence. Crimes and evil deeds are often plotted and executed in the frightening silence of the night. The people who suffer and are continuously threatened and harassed live in endless silent nights. But those silent nights are not holy nights. The Child Jesus transformed eerie silent nights into holy nights by pouring on us "love's pure light". Pure love makes nights bright and holy because it comes from God. Only God can love authentically and absolutely. The song also states that God's pure love is manifest in the Child "so tender and mild". Pure love, tenderness, gentleness are marks of the rule of the Child King, thereby making nights holy. My prayer and wish for all Filipinos and for the whole of humankind, especially for our beloved young people, is for us to welcome and live the joy and peace of the Child Jesus, who is God's pure love, tenderness and gentleness. To the youth, we elders ask pardon if the world we are bequeathing to you is darkened by toxic falsehood, violence, bullying, vices, greed and corruption. Please do not swallow or inhale this toxicity. Jesus the Child is with you. With Him, renew humanity, society, religions and creation with love's pure light, tenderness and gentleness. Christmas is for you. The EDSA Shrine will have its first tree planting project called PUNO ng BUHAY on 8 Sept 2018( Saturday) after the 10:00am Mass. This is to give tribute to our Mama Mary & our beloved Saints who interceded for us in the 1986 EDSA Peaceful Revolution. 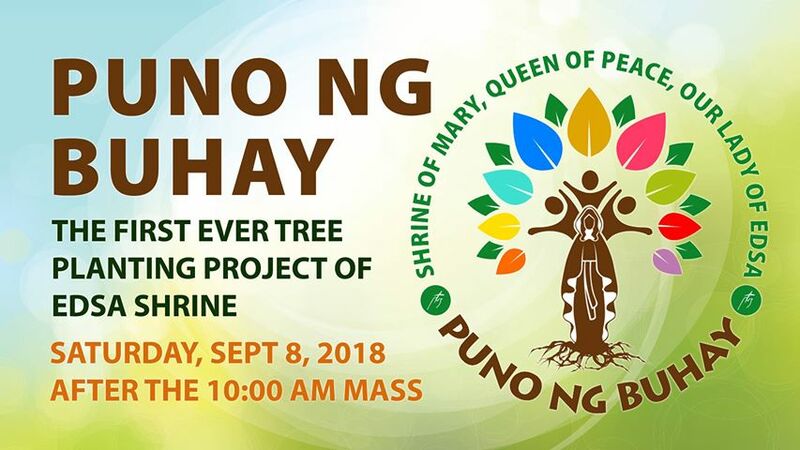 A Saint's name will be assigned to each tree seedling, which will be planted 1 foot away from the surrounding steel barricades of the Shrine along EDSA and Ortigas Ave.
Come and join us to be one of our Tree Sponsors. Sponsorship package consists of 1 seedling,1 tree certificate, 1 tree tag & 1 free shirt for a donation of Php500.00. If you're interested to help out with this project, please register at the Shrine's office or send us a message via Facebook. Thank you. We wish to remind those who have been angered by the insulting statements of people in authority; remember what the Lord had taught his disciples. He said, “But to you who hear I say... bless those who curse you, pray for those who mistreat you. To the person who strikes you on one cheek, offer the other one as well...” (Lk 6:27-29). Vengeance is never the way of Christ. It is not the way of Jesus to return evil for evil; no, we can conquer evil only with good (Rom 12:21). Up to the last moment of his breath, he had nothing but words of mercy towards his tormentors, “Father, forgive them for they do not know what they do” (Lk 23:34). - Gamutang Bayan - 8:00 A.M.
- Solemn High Mass, 12:15 P.M. - His Eminence Luis Antonio Cardinal Tagle, D.D. - Kumpilang Bayan, 7:00 P.M. - Most. Rev. Broderick Pabillo, D.D. - Second Sunday of Lent, All Masses. Saturdays, Main Chapel, after the 5:30 P.M. mass. Holy Mass will be adjusted to 7:30 P.M. 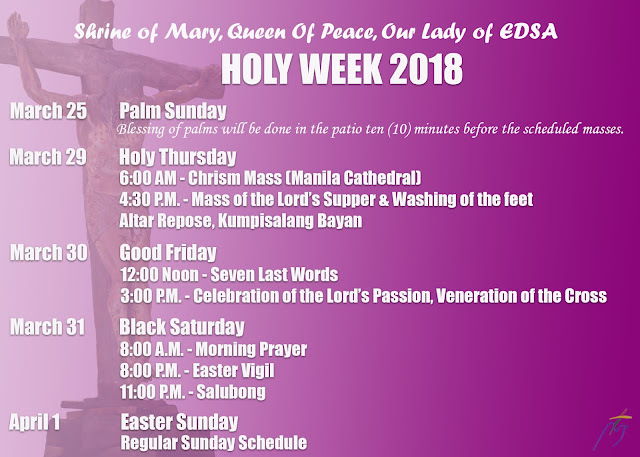 Blessing of palms will be done in the patio ten (10) minutes before the scheduled masses. All over the world, Christmas greetings express a wish that the person or community may experience joy on Christmas: Have a Merry Christmas! A Happy Christmas to you! 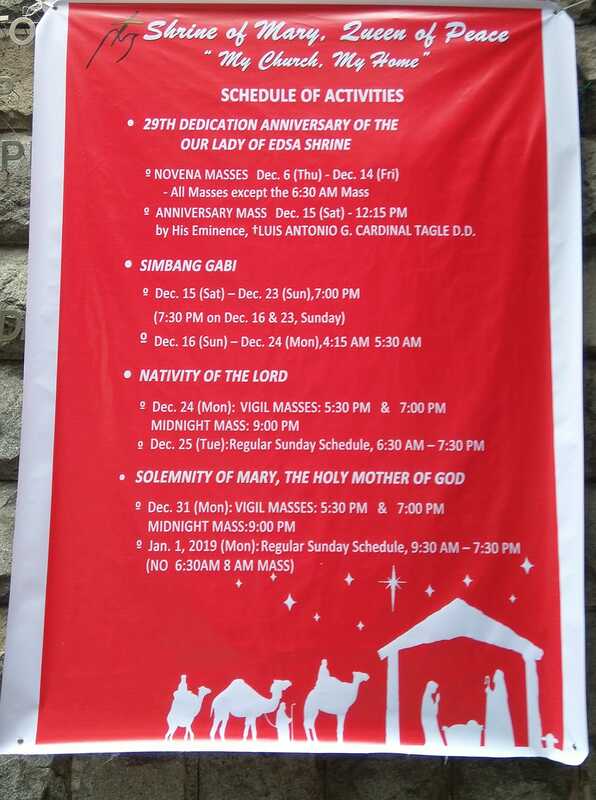 Maligayang Pasko! Joy to the world, the Lord has come! Joy is at the heart of the Christmas event. The angel Gabriel’s greeting to Mary of Nazareth was, “Rejoice, favored one!” (Luke 1:28). Responding to Elizabeth’s profuse praise of her, Mary said, “My spirit rejoices in God my Savior,” (Luke 1:47). The angel that visited the shepherds declared, “I proclaim to you good news of great joy that will be for all the people. For today in the city of David a savior has been born for you who is Messiah and Lord” (Luke 20-11). The Magi “were overjoyed at seeing the star and on entering the house they saw the Child with Mary his Mother” (Matthew 2:10-11). The first Christmas was an explosion of extraordinary joy in the world because in a simple, quiet but real way, the Savior has come – as one of us, a brother among us. He came not to destroy us to but to make us whole. Jesus’ pure goodness and genuine kindness bring joy to those who need God’s healing. The joy of accepting people, rather than the thrill of isolating them. We witnessed this joy among the drug dependents who had completed the Sanlakbay Parish drug rehabilitation program, their families, the barangay officials, the police and volunteers. We saw this joy in our Moslem brothers and sisters who had protected Christians from persecution in Marawi and joy in the Christians who had experienced heroic love from those who differed from them. We marvel at the joyful strains produced by the bell orchestra composed of poor girls who study at the Sisters of Mary Girlstown and we eagerly await the joyful music from the street kids of Tulay ng Kabataan who are learning how to play the violin. Let us nurture a culture of joy, not a culture of anger, bitterness and violence. We need good will that produces acts of kindness and goodness. “Ang pag-ibig ang siyang maghari. Araw-araw ay magiging Pasko lagi.” Maligaya at mabiyayang Pasko sa inyong lahat. Luwalhati sa Dios sa kaitaasan at sa lupa’y kapayapaan sa mga taong may mabuting kalooban!